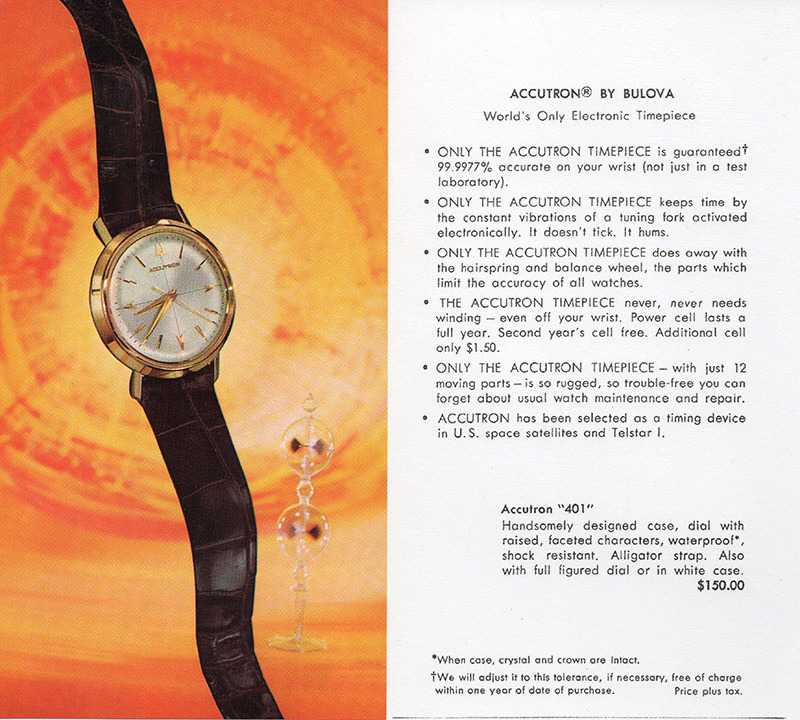 1963 Bulova Accutron. I believe this is the "401" variant. Recent purchase online for a reasonable price. 10K Gold Filled case and case back. A few scratches on the crystal, but nothing that can't be fixed pretty easily. Unfortunately, my other Accutron needs an index wheel, so I bought another one to satisfy my need for a working example while I try to find a good index wheel for my other one. Runs accurately and hums along nicely! Accutrons are truly an engineering marvel! I would take a picture of the movement, but an Accutron is something I'm a little more afraid to open myself than a regular watch. I would have my jeweler open it so I could snap a quick picture, but they send out watches to a watchmaker that doesn't work inside their store. 401 looks to be a good match. If you do get the back open, please report what the case number is. It should be stamped inside the caseback. A fine looking watch. I suggest finding a watch maker that you can deal with directly. Two reasons. First it gives you direct contact with the person working on the watch, including the ability to ask questions and or make suggestions regarding repairs (and get photos). Second and maybe more important, it will most likely be cheaper. Depending on where you live and your willingness to mail your watch to the watchmaker we might be able to recommend someone. You can also check the NAWCC website to find someone close by. Understand that Accutron is a bit specialized and some 'makers do not service them. There is another local jeweler that has a watch maker in their shop that I may try in the future. But the current jeweler I go to must not take very much of a cut for watch repairs because the couple watches I've had done were done for a very resonable price. But on the other hand, one watch I had repaired had an issue the same day I got it back, and the other seems to be running a bit slow. So maybe I'll look into the other local shop soon.